California State University San Marcos is a big part of community growth in North County as several students relocate to the area in order to attend college at the University. The campus has developed an amazing School of Arts department dedicated to nurturing the arts and developing artists. Often times connecting these growing artists to resources beyond a school setting to find careers within artistic fields. In order to gain public view, the school annually hosts dance performances that feature guest artists and students who take part in the creative process. Within the dance department at the School of Arts Dr. Karen Schaffman (dance artist) and Anya Cloud (dance maker) have been nurturing young men and women in health, physical development, memory skills and movement education. 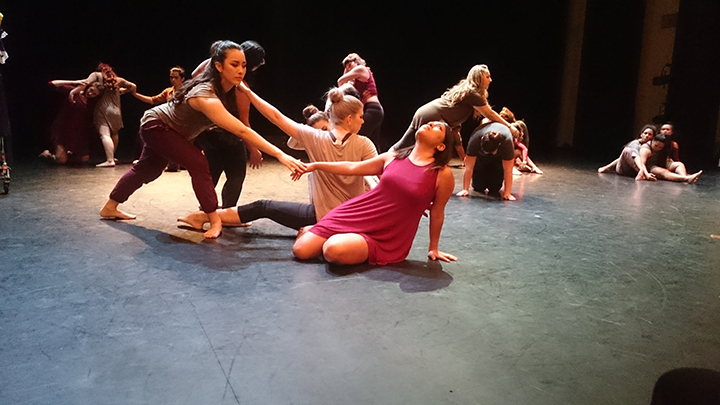 At the beginning of May every year they host the Spring Dance Concert at CSUSM of which they currently proudly featured two amazing performers who happen to call Escondido and Valley Center home. “I know two people in the performance and thought it was awesome. I just had to come see it,” said Roseanna Garcia of Escondido, a biology student at CSUSM. Ms. Cierra Potts and Ms. Angelina Vasquez were among the more than 30 men and women who came together to create this versatile dance performance that included contemporary, modern, contact dance concepts combined with ballet, hip hop and improvisation. Not necessarily in that order. This year’s performance had a much stronger sense of struggle and strength. Performers were challenged with strong movement that required both stamina and precision. Unlike last year’s performance, this two-night show had more uniformity in motion and combined choreography that celebrated unification with improvisation and randomness. I can honestly say that in the four years that I have taken part in viewing this performance and they way the school encourages movement and self-discovery, no two performances are ever exactly the same. As Professor Cloud continues to say, “We are always in our present bodies and our present bodies are never in that same exact moment ever again.” Our ever-changing bodies should always be embraced. “I was in three of the spring concerts over the years and one of the fall concerts while here. I love being involved in the dance program because I CAN BE ME. It helps me to open myself up to new people, create bonds, friendships, families… and to trurst myself and to push myself… and to always keep my mind creative. I plan to continue my contribution in these performances for the next two years,” says Angelina, a psychology major with a minor in dance and criminology at CSUSM who proudly represents Valley Center. Ms. Vasquez is currently a junior at the University. “I was in three performances for this show,” said Cierra Potts, they were all during the second half of the show and back-to-back. “I felt ready to perform and fabulous about this years show.” Ms. Potts is a human development and counseling major and dance minor who resides in Escondido. She has recently moved to Escondido with friends who attended the show to express their support in her craft as Ms. Potts aspires to continue dance professionally beyond her education at CSUSM. Currently she teaches dance at Big Kids America in Carlsbad. “I want to start my own company and establish an after school and retreat program for youths,” stated Cierra, as she plans to reside in Escondido for quite some time. “I liked it. It was very intense and entertaining and fun. I would definitely come back and love theatre,” said Sophia Kumara, who took pleasure in experiencing the Spring Dance Concert for the first time. This year’s opportunity to experience the Spring Dance Performance has come to an end, but keep your eyes out for the Fall Dance Concert that takes place in November and the next Spring Dance Concert that continues to take place in May. The dance department at the School of Arts at CSUSM has great plans for the future so stay tuned for even more amazing opportunities to experience dance performances live and locally.